1) Encourage these new believers to remain strong in the face of increasing persecution. 2) Equip them to continue in the faith throughout eras of hardship. If the dispersed believers lived exemplary lives among unfamiliar people in new areas, they could be living witnesses to the reality of Jesus as the Hebrew Messiah. According to James, the way of God is accepting the reality of persecution and applying faith to each and every instance. This “holification” of suffering that had been modeled by Jesus could indeed provide excellent witness to the reality of their faith. 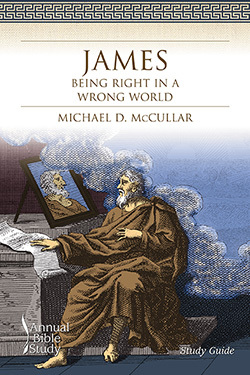 As James “tells it like it is” he consistently offers paths to effective living that can only be accessed through a personal relationship with God. Michael D. McCullar is the executive pastor of Johns Creek Baptist Church, Alpharetta, Georgia. He is a graduate of the University of Alabama-Birmingham, New Orleans Baptist Seminary, and Oxford Graduate School. He is the author of Sessions with James, Sessions with Corinthians, Sessions with Timothy & Titus, A Christian’s Guide to Islam, and co-author of Building Blocks for Sunday School Growth and Sessions with Mark. The Teaching Guide includes suggested worship outlines for both traditional and contemporary worship services, approaches for leading group discussions, and teaching plans for adults, youth, and children. The Study Guide helps learners understand the biblical background of James, how to interpret it, and its basic theological themes. Each session features thoughtful questions for reflection and discussion.